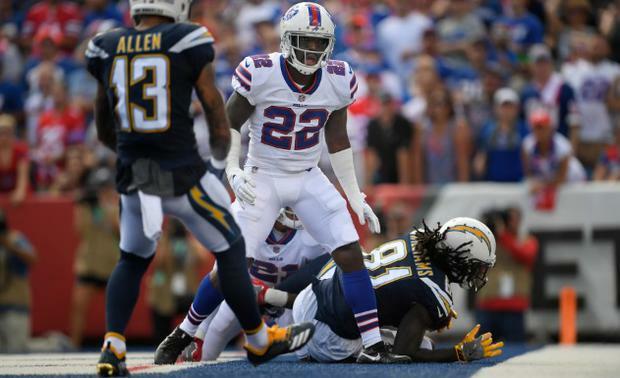 Buffalo Bills cornerback Vontae Davis pulled himself from the team's game against the Los Angeles Chargers, telling coach Sean McDermott "he was done." McDermott spoke with reporters Sunday after Buffalo's 31-20 loss to the Los Angeles Chargers and explained that the 30-year-old Davis voluntarily left the game in the first half and did not return. "He pulled himself from the game. He told us he was done," McDermott said, per the Buffalo News. "When I get back there [to the locker room], we'll continue to communicate and get things figured out. I wish I had a better answer." McDermott had no further insight on why Davis decided to stop playing. The 10-year veteran was not injured, according to the Bills' head coach. Davis was a surprise inactive for the Bills' season-opening 47-3 loss at Baltimore last week, despite his coach calling him a healthy scratch at the time. He was the planned starter Sunday against the Chargers, but at some point in the opening half Davis took himself out of the lineup despite the secondary also losing Phillip Gaines to an elbow injury. Without Davis and Gaines, the Chargers built a 28-3 halftime lead. ESPN's Chris Mortensen reported that Davis changed out of his uniform and left the stadium at halftime. Naturally, Bills teammates were perplexed upon hearing the news, with many saying they were left with the impression that Davis retired from the NFL on the spot. "I don't have nothing to say about Vontae," linebacker Lorenzo Alexander said after the game, according to ESPN. "I'm going to give him a little bit more respect than he showed us today, as far as quitting on us in the middle of the game. "I never have seen that. Pop Warner, high school, pros. Never heard of it. Never seen it. It's just completely disrespectful to his teammates. ... He didn't say nothing to nobody. I found out going into the second half of the game. They said he's not coming out, he retired. That's it." "I've never been around anything like that. I've never heard anything like that," defensive tackle Kyle Williams told the Buffalo News. "I think the only thing to say is he's where he needs to be right now." "I did lose respect for him as a man," safety Rafael Bush said. "To quit on your teammates when things aren't going so well in the middle of a game ... that's definitely disrespectful." Davis played just five games in 2017 with the Indianapolis Colts before suffering a torn groin muscle. Last season marked the first in Davis' career that he did not record an interception. Davis was a 2009 first-round draft pick by Miami and played three seasons (2009-11) with the Dolphins before suiting up for the Colts for the following six seasons. He signed a one-year, $5 million contract with the Bills this offseason.